Long ago in an America without internet or cell phones, it was song that moved a generation to take action. Music united generations, gave the people a voice, and served as an undeniable call to action. 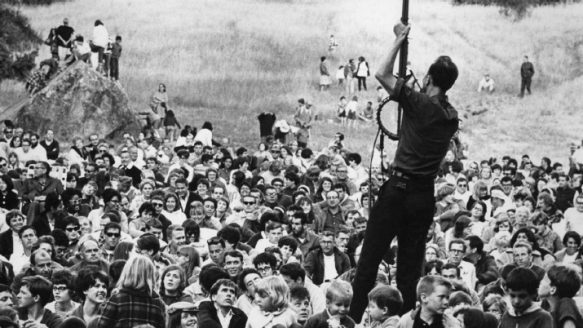 The Vietnam war protests of the 60s and 70s, Mississippi blues of the 20s and 30s, civil rights marches in the 50s, the great depression in the 30s – all defined by songs of protest. Protest music served to comfort and unite, it was a call to action, a rallying cry, a means of letting us know we were part of something. Muddy Waters, Woody Guthrie, Pete Seeger, Bob Dylan, Woodstock, fade into obscurity. The power of protest songs lost on a generation of gamers and tweeters. I ponder the outcome of the “occupy movement” if only they were able to put their rage into song. Music has become an obsolete tool for change. I’m not saying that no political music or artists exist, my relentless pondering has however led me to one conclusion – a tweet will never touch the soul, a facebook post or a comment on reddit will never move us in the way that music can. The world is a different place from the era when thousands of voices sang out in unison, not just hoping for change but expecting it.